Epiphan streaming and recording solutions support streaming to multiple users through Content Distribution Networks (CDNs). Using a CDN maximizes the number of available concurrent clients, while at the same time reducing the load on the uplink internet connection. You can quickly and easily configure any Epiphan recording and streaming appliance (Standalone VGA Grid, Networked VGA Grid, Pearl, VGADVI Broadcaster, VGADVI Recorder, DVI Broadcaster DL, Lecture Recorder x2 and VGADVI Recorder Pro) as a client to a CDN provider using RTMP or RTSP. In this example we will configure the first channel of a VGA Grid to live stream to StreamZilla using RTSP. The same approach can be used when configuring other Epiphan appliances mentioned above. Make sure that the VGA Grid system has been properly deployed. 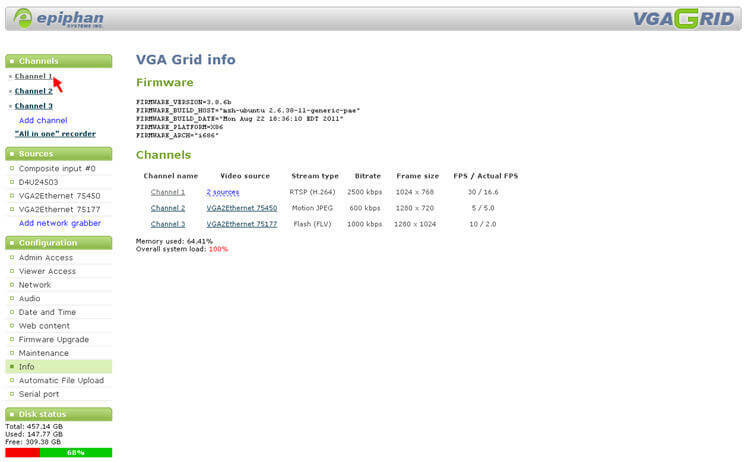 Log in to the VGA Grid Web Admin interface. 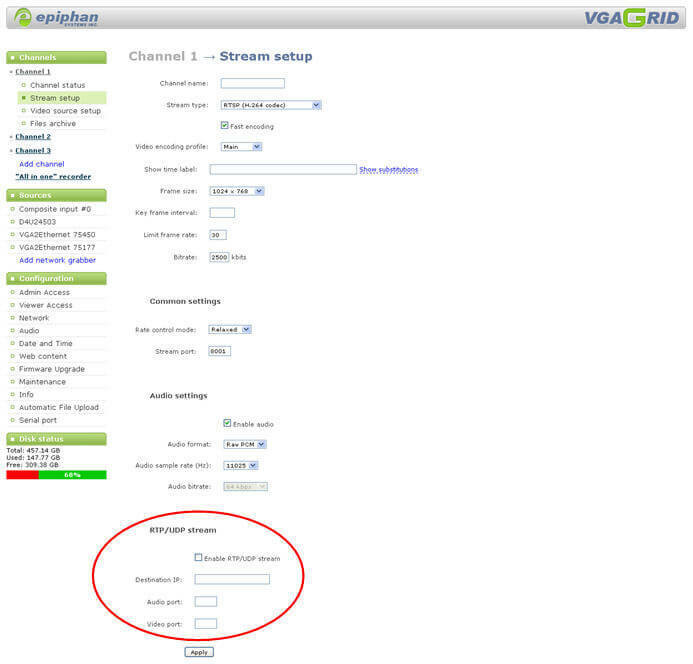 In the drop-down menu click Stream setup and select RTSP (H.264 codec) in the Stream type field. 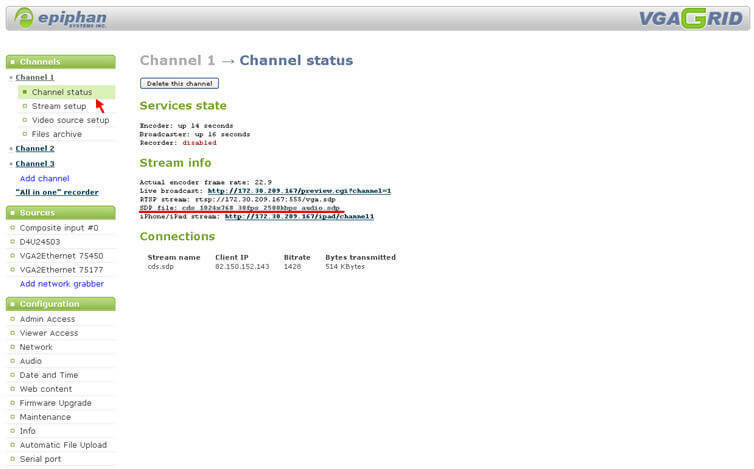 Note that the RTP/UDP stream section is displayed at the bottom of the page. Do not close this page. Open a new tab in your browser and log in to your CDN Manager’s account. Click the Manage live streams icon. Then click Add a live stream. A new window is displayed. Configure it as shown on a screenshot below. Select QuickTime in the Stream type field and enter a user name. Then click Next. 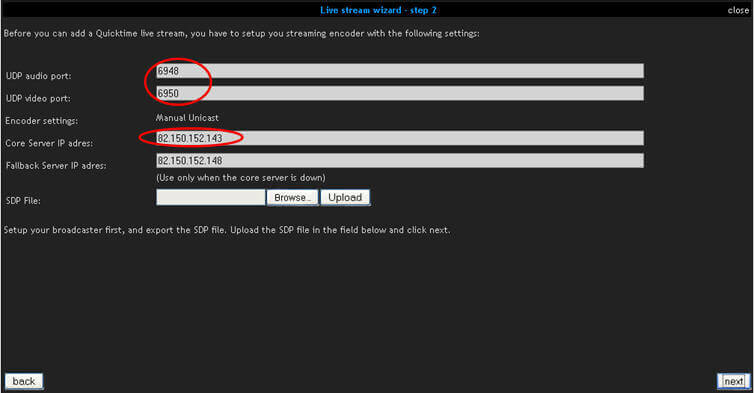 StreamZilla displays a live stream settings window with UDP audio port, UDP video port and Core Server IP address values. Leave this window open and go back to the VGA Grid Web Admin interface window. 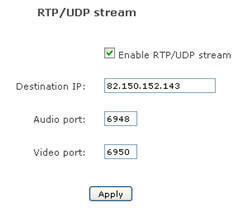 Fill in the fields in the RTP/UDP stream section using the information shown on the StreamZilla window. Now click Channel status. The download the SDP file and save it on your computer’s local disk. Go to the StreamZilla window. Upload the SDP file and click Next. CDN Server will finalize the process. Wait a few minutes until live stream setup process is complete. In this window you can generate a code that allows watching your stream anywhere. 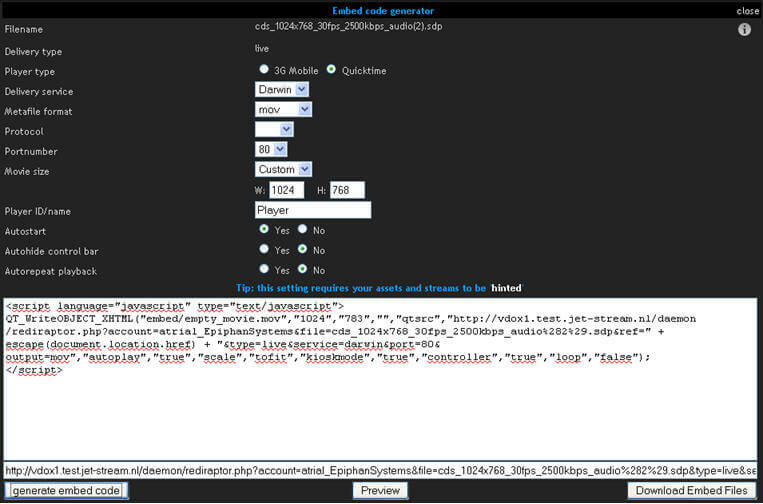 Check all settings and click the Generate embed code button. Script and http‐link information will be generated. After embedding this script in your website you will be able to watch the broadcast from there.